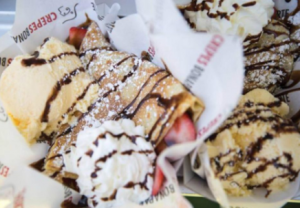 Crepes Bonaparte recreates the experience of enjoying French crepes on the streets of Paris, France with made to order savory and dessert style crepes. Signature menu items include the Caprese (roasted tomato, seasoned chicken, mozzarella, and garlic pesto), California Sunrise (avocado, crisp slices of bacon, roasted tomato, cheddar, and a fresh cracked egg), and the HazelBerryAna® (fresh strawberries, sliced banana, and Nutella topped with whipped cream and a chocolate drizzle). 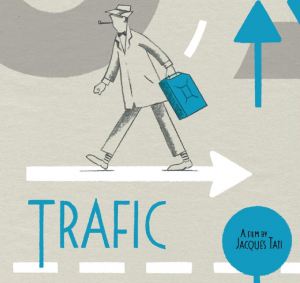 Trafic features the bumbling Monsieur Hulot, kitted out as always with tan raincoat, beaten brown hat, and umbrella, navigating Paris’s highways and byways. In this, his final outing, Hulot is employed as an auto company’s director of design, and accompanies his new product (a “camping car” outfitted with absurd gadgetry) to an auto show in Amsterdam. Naturally, the road there is paved with modern-age mishaps.